As one of our students you will have the change to compete for a number of awards and accolades, and take part in our various schemes. Don't forget you can keep up to date with all of the University's latest achievements by joining the conversation on our BCBS Facebook Page, or by following @BCUBusiness, the Business School Twitter account. 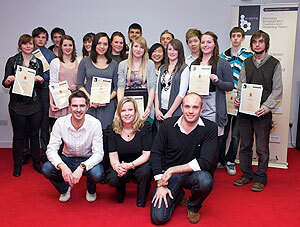 Every year, our Marketing, Advertising and PR students show what they're made of in the B-hive competition. It's the chance to impress local industry judges with your solution to their brief – and win paid work experience at top local agencies. We've got a fantastic record of wins across marketing, PR and digital marketing categories. is the amount of virtual money our students invest. Want to test your skill on the stock market? All the Business School's joint degree students get to do just that with our innovative and exciting Share Game. Start with a virtual £100,000 to invest real-time in the UK stock market – and compete with your fellow students to make the most profit. It's a realistic trading experience that students really love – you can imagine the competition! It's demonstrated some really outstanding talent: in 2012/13 Kun Min Lui ended the game with a portfolio value of £131,513 beating nearly 300 other students … as well as the course leader, a qualified investment adviser! The 31% return over just four months, outstripped the market return threefold. 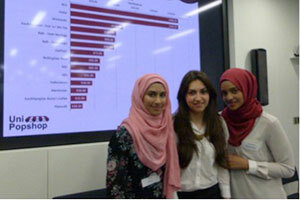 A team from Birmingham City Business School made it to the finals of ‘The Pitch’, a national competition run by the Chartered Institute of Marketing (CIM), in 2012. Jordan Atchison – Management Masters Programme – was instrumental in helping his team into the finals. Thanks to his efforts, the University won the regional heat of the competition, beating teams from a number of local universities, and Jordan was crowned the University's 'Postgraduate Student of the Year' in the Tell Us Your Story Awards 2012/13. Have you ever wondered what it would be like to run a business? Then the UnLtd UniPopshop Competition could be for you. This national competition allows you to showcase your entrepreneurial flare and tests your business skills, through a set of team challenges held over 3 days. This hands-on, fast paced competition is great way to build your skills, network with like-minded students from a variety of universities, and practice your salesmanship! It also gives you the chance to give back to the community, as any profits made during the competition are donated to chosen social enterprises or charities for your team. Three of our current students took part this year and shone in several areas – one of which was generating the highest revenue during the selling challenge. So, could you be the winning team next time?